As Fall is quickly approaching I am going to make style boards of Fall Staples. If you missed my last post about Fall Staples, click here! Anyways, all through Fall and Winter I wear Riding boots, and cute little booties! They are what I seem to gravitate towards the most. Although I had a couple from last year that are still in excellent condition, I had to stock up on some more, because as you know already, I like to shop. 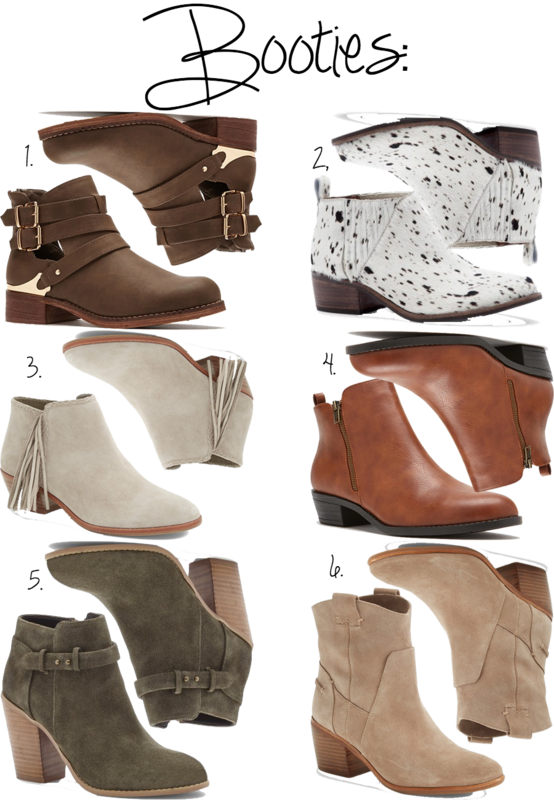 You will be seeing booties everywhere in the next couple of weeks and stores receive new inventory so be on the lookout! I bought this pair during the Nordstrom Anniversary Sale for a great deal! The materials are great and will hold up for years. I just have to remember to spray them so they don't get ruined by rain or snow. I bought these in my regular size, but they just were way to tight, so I exchanged them for a half size bigger and they fit perfectly! So if you are going to buy (which I totally recommend) size up! Also the heel height is perfect, super easy to walk in, but make your legs look great!